Qualification: Diploma in Pharmacy or Bachelor of Pharmacy. Registration with Delhi Pharmacy Council. Qualification: Completed Auxillary Nursing Midwifery (ANM) course. Registration with Delhi Nursing Council. Pay scale: Rs. 8 per registered patient at AAMC and Rs. 10 for each wound dressing if done by him/her. Minimum assured guarantee of 75 patients per day to be calculated on monthly basis. Qualification: 10th class passed certificate. First aid training certificate from St John Ambulance Brigade. 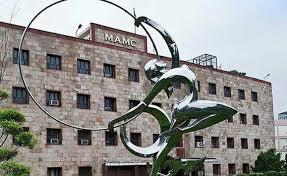 How to Apply : Eligible candidates may apply online at MAMC‘s website (http://www.mamc.ac.in/) from 06 Oct 2018 to 21 Oct 2018.